When someone experiences trauma, its physical and emotional effects can sometimes impact their children – and this can begin in utero. You see, during times of stress, the body releases cortisol – and as you know, that’s one of the ways our body helps us cope with physically or emotionally difficult situations. But when trauma elevates cortisol to unhealthy levels, it can have an epigenetic impact – not only on the client, but on their children as well. 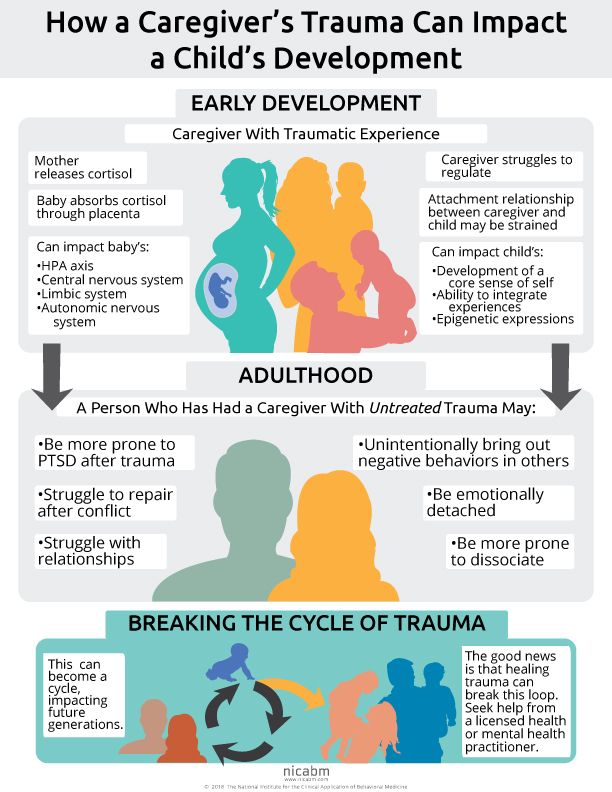 Well, we created an infographic you can use with clients to help them visualize how trauma can get passed on through caregivers. If you’d like to print a copy for yourself, just click here: Color or Print-friendly. This infographic is both insightful and inspiring. In working with families, in an educational setting, its beneficial to interview the mother, in particular. Through this intake, we are able to share with parents/caregivers, practical strategies they can use to promote a more nurturing environment for their child. Similarly, the more I know about the development of a student, I can determine or adjust my communication style to meet the needs of my client. After determining their educational goals, the educational team can design the best program for students who may have been exposed to trauma. Thank you, for making this article available to me. There is a theoretical possibility that psychotherapy can reverse or alter epigenetic changes related behaviour. Think of it this way: Thinking (cognition) is a neurochemical activity. Particular thinking styles elicit different immunological and other physiological pathways. These pathways in tandem can potentially alter or weaken negative epigenetic expression. The challenge today when it comes to verifying effects of counselling / talk therapy/ psychotherapy is when one approaches this from the lens of Cartesian dualism. Aka, something can only make physiological change if there’s direct physical intervention (drugs or surgery). Cartesian dualism thinks the mind is not a physiological entity and therefore it’s qualities (cognition and emotional regulation for example) cannot be beneficial in correcting pathological pathways in body and mind. Advances in neuroscience today are fortunately paving way for the true interaction between body and mind. In conclusion, the chart is based on sound and current scientific postulates. While I am aware of research on multi-generational epigenetic changes and other developmental effects created by stress during gestation, I have not seen any research that supports the claims made here about the effects of treatment. The emphasis in “a person who has had a caregiver with UNTREATED trauma” suggests that there is evidence that those changes in utero can be prevented by giving therapy to a pregnant woman experiencing stress or perhaps even that they can be reversed by treating the caregiver later. Is there actual *evidence* showing that therapy for traumatized pregnant women 1) prevents or reverses stress-related epigenetic changes in the fetus or 2) prevents or reverses the prenatal developmental problems associated with stress? It seems even more unlikely that there would be *evidence* showing that therapy for a caregiver could reverse epigenetic changes in a child that originated from prenatal experiences, and extremely implausible that it could reverse anatomical changes to the nervous system. And in the third box, again, is there any actual evidence that demonstrates those epigenetic changes can be reversed in offspring or later descendants through therapy? I don’t doubt that therapy is valuable to many people in breaking a cycle of trauma, but I do doubt there is a solid body of evidence (enough to make a clinical claim of this nature) supporting the specific implication of this poster that therapy will reverse a set of prenatally-induced epigenetic and developmental problems. I think this is misleading as to the state of the science and known or even plausible mechanisms of actions of therapy. Appreciate the thoughtfulness here and the drive for us to be fact-based and credible. Thank-You Ruth for another info-graphic that is easy to understand and use with clients who are struggling to understand what may be impacting their lives. Thanks for sharing! Will post and share. Ive been looking at P.A.C.E for healing trauma and repairing relationships with the caregiver. I wouldn’t use this with clients as the language is quite inaccessible without a lot of explanation (HPA axis, epigenetic expressions) and is very deficits focused. As both a clinician and a client, I have found that psychoeducation and scientific knowledge of what is happening within the body and societally are empowering tools. I am not sure what you are referring to as “deficits”. Clients have always responded well in my experience when the work in session is happening on the intention of an even playing field. Clients come to clinicians for their knowledge, not authoritarian screening or pity. I love the above chart. At the moment I have no extra monies. Hopefully this will change in the near future. Are any of your courses funded? I have a woman in one of my support groups has a very stressful life and traumatic past. A month ago she gave birth to a premature baby. They are impacted by poverty, they are immigrants and there is a past history of abuse. English is not her first language. I got her a lisenced counselor but she did not follow through after the first meeting. This series will help me have more ability to help her and her family, and to find a counselor or therapist who can help. Believe her actions. She might be more interested in obtaining affection and approval thorugh her victim stance. Which is totally supported by her circumstanmces. I work with families who struggle with emotional upheaval. The approach is based on somato-emotional release and currently effectively used in different countries of Europe like Germany, Switzerland and Spain. There must be something similar in the United States, too. It can help young parents release stress, anxiety and emotionally challenging situations with their baby and becoming more prone to creating an affectionate tie within the family. It is played out to do with the child together, it’s a lot of body work, breathing techniques, posture, letting go of emotions…. All in contact with the baby, which will contribute by his or her own reactions. If you’d like to know more let me know! The Counselors in my Diocese are receiving training on ACES. I think this could help supplement the info we currently have. Whilst there are some salient points I think this is a little narrow and focussed solely on the mothers history and a single child. I am interested in knowing why it is that the same mother could give birth to multiple children and not all of them would inherit the trauma? They have the same care-giver according to the info-graphic and presumably the same environmental conditions. Has it been considered that this may go beyond just the care-giver and that there may be additional factors in utero that give rise to this and not just the care-giving provided by a traumatised mother? Sure, a mother/father with untreated trauma has a higher probability of having difficulty bonding and creating secure emotional attachment for the infant, but what if something physical, such as the umbilical cord around the infants neck in utero, prevents the flow of oxygen to the brain and subsequent completion of synaptic movement and neuro-development so that the infant’s neuro-development is incomplete when born and is already in a position where normal internal attachment cannot automatically occur for the infant and neuro-developmental trauma is a given no matter how good the care-giving is? We cannot presume that multiple children of the same mother have all had the same environmental conditions in utero. The pregnant mother can encounter a traumatic event in or outside of the home, e.g., a bad vehicle accident, a home invasion robbery, the death of a parent or close friend, etc. Undoubtedly, each child’s developmental journey in utero would be as unique as a fingerprint. I’m a mother of twins and they definitely have had different birth experiences, although I had a c-section. They display completely different behavior. I would also go as far and say that they didn’t get the same amount of attention during pregnancy. One was always more present and the other more drawn back. It’s interesting, now it’s the other way around, however, I do agree we cannot claim to know it all in this area. Thank you so much I am sure this infographic will be helpful when explaining the impact of a Mother’s trauma on an unborn child . Thank you. It clarifies and gives substance to what I already knew. This is a useful tool to use with clients. Thank you! I am working with team of primary care physicians at the veterans hospital in Atlanta, GA to create a Tai Chi program. We are working with clients to alleviate symptoms of PTSD and the materials you have created will be very helpful. Thank you for excellent work and assistance in a most needed domain of work. It seems very helpful in so many ways I don’t wish to generalize it in such a short space as this comment. However, it is helping me PERSONALLY, as well as professionally, as at age 51 .. the past.. becomes.. the present .. and the future. Thankyou. Not a single participant from : France, Italy, Spain? There were participants from 99 different countries, so I’m sure people from those countries tuned in too! We just couldn’t list them all here. I was uncertain whether I should comment because I’m watching this series as a patient, not a therapist. But I see that many of us here are patients! Without knowing it until recently, I’ve lived with developmental trauma for the full 75 years of my life. I treasure the information you are sharing, increasing my understanding of the forces behind my experiences. I’m healing now, finally, after years of failed efforts because I’m both working spiritually and recognizing that my down-regulated behaviors are wired in my body and emotional centers in my brain. With a caring therapist/teacher as a skilled guide and witness to my story, and the safe environment she created for me, I have been able to open up and truly feel love and other positive emotions for the first time in my life. Thank you for what you are bringing to us, both patients and therapists! I am systematically happily surprised with your materials. The professional levels, your generosity in sharing and the quality of your presentations, richly contribute to planetary evolution (via the recipients). Given the limited professional development/financial resources of some of our programs (in Canadian non profit agencies) our involvement might appear less representative than it actually seems, because we might not be purchasing as many programs as you offer. Some of this information is new to me and very helpful to understand the whole picture. This infographic overly BLAMES the mother when the father’s untreated PTSD can be much more pronounced, through constant verbal abuse, depression and actions that dismiss his own need for help. Very biased infographic. Why call it “caregiver trauma” then single out the mother? Ann, I don’t view it like that. My mother’s father died before I was born and she was in an abusive relationship with my father. Both may have pushed up her cortisol levels and neither were factors she could control. I did get complex PTSD as an adult but none of the other three siblings did. This helps to explain why. Ann, I agree with you. This does appear to blame the mother. I have complex PTSD and it most likely began in utero as her relationship with my father was not the best. I have been in therapy for most of my adult life and can very much see the changes I have been able to make with the proper modes of treatment. My sister, not treated, has her own issues and the cycle had continued. I see this graphic as way too narrow, as some issues are intergenerational and more. I see this as and overview of the trauma response there is no indication here where the trauma originated from that I see. This shows the path of the reaction to trauma as it is passed to the child. The father could be the source of the trauma the mother is experiencing it does not say. None one is really to blame; people are just doing the best they can. Dysfunctional behavior is just an end result that keeps getting passed on unwittingly by everyone; caregiver, mother, father, teacher, etc. I believe this is more common than we realize. The key is to just be aware that it has happened, is harmful, education is needed to bring this into awareness for change by ALL, & get help to heal…forgive all including yourself for being subjected to this harsh event & influences. Use it as a wake up call to become more aware of how we are treating each other & change. So while this work is great and offers ways to deal with and function more easily within this world, I wonder if true healing (evolutionary healing) can occur without a connected intuitive approach that understands how our spirit functions in its battle with our separation from Soul. I did hear one of your speakers discuss the need to be more consciously present within one’s own body, and moving with this awareness and living in a heart centric way is, I feel, the only way to go. Thank you for sharing this infographic. It’s clear and simple which is important for people who don’t come from the trauma informed field. Thank you for the information, understanding better is helping better. This series has given me much guidance in working with young pregnant moms. I do a home visit with them before the birth to talk with them about postpartum depression, but I should be talking with them earlier about how they were parented and the their relationships. Love having a visual reference! Thank you! I am so excited to see this “myth” verified as an actual scientific truth. The elder women in my country (Ecuador), especially the shamans, told my mom about this when she was pregnant with my sister to keep herself safe and avoid conflict with my dad because my mom was experiencing lots of emotional and physical trauma from my father at that time. Now my sister is experiencing the effects of such trauma, with heart issues, high levels of depression and anxiety that a team of people including myself are helping my sister to cope with and regain wellbeing for herself. This information used to be considered “new age woo woo” and myth for pregnant women who had experienced domestic violence, now we can prove that the harm is not just to the mother but also to the fetus itself. This can change many family laws when it comes to protecting the mom and child and custody matters. I am fired up about this because I myself have gone through domestic violence and trauma during my pregnancy where now I am doing everything I can to help my child transcend inherited traumas because it has showed up in her life and attracted more trauma and also affected her attachment style throughout her younger years. Now with my help and intervention it is going from disorganized to more organized – a working process for sure! Thank you for brining this to the light! I appreciate Lucia Gabriella’s comment that the older women and Shamans called attention to this when her sister was pregnant. I hope this affirms such intuitive intelligence and hard earned wisdom. I also appreciate her efforts to undo the kind of knots that get passed on in her own family. There’s a lot we can do personally to heal. I think that informing oneself and striving to heal should be added to the conclusion where the advice is to seek professional help. 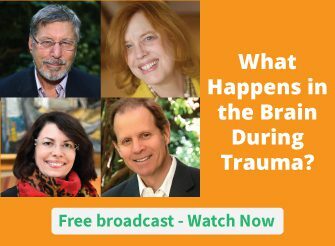 Many professionals are not actually trauma informed or capable of this kind of healing work. Typo when her mother was pregnant with her sister. Thanks for the infographic! Yes, it makes sense that a baby could be exposed to high levels of cortisol and other stress hormones if mum is traumatised or chronically stressed during pregnancy. I wonder about the mechanism of effect on the baby after birth. Is some damage already done, or could it be a case of rebound withdrawal, e.g., when a mother has been taking high levels of Vitamin C during pregnancy, the baby may develop rebound scurvy … love to hear opinions on this. Thank you so very much! I will add this to my parent information/support notebook. Can you say what level of trauma or how much cortisol would be needed to have such an effect on a baby developing in the womb? Without some sense of degree this might make mothers worried unnecessarily that they are having an adverse effect on their child. MANY HEART-FELT THANKS FOR THIS INFOGRAPHIC! This looks like an excellent Infographic. Thank you very much. I ought mention, that I will be using this infographic on clients who belong to the population I researched , i.e., the unacknowledged trauma (and grief) of competent, non-disordered adults who survived parents with a severe mental illness, and with whom I work with in my clinical practice. It’s always good to have a clear visual depiction of something that is actually quite complex. Many thanks. Sorry, I should have included that if people are interested… they can Google my name: Suzette Misrachi to access my (easy to read) trauma research entitled “Lives Unseen: Unacknowledged Trauma of Non-Disordered, Competent Adult Children of Parents with a Severe Mental Illness” freely available at The University of Melbourne, Australia. This research will come up along with trauma-informed articles I’ve posted on medium.com You should also be able to access my resource website. Yes, thank you for your all your efforts & sharing. God bless you for your research! One rarely hears of the acknowledgement of the voiceless pain experienced under these conditions—particularly in my age bracket before the meds that were eventually developed. I realized many years later the self-sabatoging mechanisms that thwarted my own chances at motherhood. Thank you for the direction to more material! Michelle, I read your passionate comment and was greatly moved. I was also left wondering which research you were referring to? Absolutely spot on information. This has immediately helped me recognize patterns that trigger negative reactions by traumatized patients. This is a very useful tool!! Yikes! This explains a lot about me! I just reentered therapy to address some of my childhood issues that haven’t yet been successfully resolved. Thankfully I have made significant progress, but still more to do for greater healing and wholeness. Very interesting although not new to me as a Time Line Therapy therapeut. In TLT we sometimes experience clients going back to the uterus and there they clear the situation (it’s not their trauma, not their experience but their mother’s. The poster is very nice and helpful. This poster is very striking! It is so clear, so educational. It does not leave much room for doubts. Thank you to all who developed it! That’s very helpful, thank you.